Wood Green is very fortunate to have three decent frequent services into Zone 1 - 29, 67 and 141 - when you consider how frequent the Piccadilly Line is. Not many areas are so blessed. However those routes are all prone to problems in Zone 1. I suspect the users of the 329 are actually fairly happy to have a localised route that is frequent and reasonably reliable - not perfect but not bad IME of using it. They wouldn't be pleased to be relying on a route running from Zone 1 if it meant big gaps, curtailments etc. The 329 is not exactly immune from those itself and that's just with having to deal with Enfield's, Palmers Green's and Wood Green's traffic jams and parking. I assume you left out the 243 because it isn't as 'decent' as the other three...if so I'd say your right, that route can be a right pain! I left 243 out accidentally because I was thinking about the N-S routes through Wood Green. I've no issue with the 243 - perfectly decent and very busy route. Therefore Wood Green does very well in having *four* routes to Central London and covering a lot of the City, Holborn and West End in the process. The only bit it misses is Oxford Circus and west thereof. I suppose the problem with using 84 for the 83/483 split is that it is deep in Metroline territory. As Metroline was always going to be a bidder, there is still scope for confusion, if only internally. If the 84 number ever gets used for a TfL service, it'll probably be in south London. Alright! A new way of getting home from school! Just submitted a FOI request regarding the change. Not hopeful for any useful response, but better than staying quiet! I can predict TfL's response - "The change is just a proposal at the present time. We will be consulting in 2016 and you will then have the opportunity to comment alongside other users and stakeholders. We therefore suggest you await the consultation when you can read the case we are putting forward to support the proposal." The key point you raise is "where is the detail" and that's the bit I would push to get hold off. The one hour / transfer ticket will be dismissed as a matter for the Mayor as he / she have responsibility for fares. It'll be interesting to see what TfL *do* say in their reply. I have read that the final routing for the 483 through Wembley is open to consultation - it might follow the 182 or the 245. I know we are somewhat cynical about consultation (I certainly am after the fiasco in my area over the W11 / W15) but I think TfL are d*mned if they do and d*mned if they don't. You only have to look at the hundreds of pages of ideas and comments here about route proposals to see what could happen if TfL said "ooh here's a blank sheet of paper covering Kingston - please design a bus network for us". It's not really practical - people ideally have to have something put in front of them in order to trigger a response. What TfL don't do is set out a spread of options around a change nor do they have a dedicated facility to allow people to submit ideas - like the new route ideas that we have here. TfL review areas on a predefined programme - why no invitation to the public to contribute their views and ideas about bus in the area under review? You never know the people who use the services (not just foam at the mouth enthusiasts) might have an opinion about them! If we look at the more contentious but large scale current consultations (436/452, Ealing to Harrow, Ealing to Hounslow / Brentford area) there are certainly issues. The new links being suggested are no doubt needed but we have no idea as to what has been done to evaluate the impact on people who lose a through bus that they currently have. TfL MUST have done that work but they don't tell anyone which leaves the whole issue open to wild speculation. Do they not want to tell people? Are they proposing something even though it will cause disbenefits and issues for people? Is there really no disbenefit overall? Regardless we should be told. In my recent consultation responses I have filled in the bit where TfL ask if there was sufficient information - in each case I have said there wasn't enough info and that TfL should change their approach and provide much MORE info. Even something simple like the 481 proposal - in itself a good thing - doesn't give a rough guide as to first and last buses especially for the new Sunday service. I'd have thought prospective users *and* people living on the roads served would be keen to understand that. People might be narked if buses rumble past their nice houses at 0500 on a Sunday but perhaps not at 0900. Why didn't TfL give an indication about this? There are countless other examples of missing detail. Only problems I can think of are that the 79 gets drawn into the traffic vacuum that is Hanger Lane & the North Circular and that it doesn't help people beyond Wembley who use the 83. Je suis confused. I thought the 483 will serve Wembley Central regardless of the route options as it's either via the 182 (Harrow Rd / Watford Rd) or via Wembley Hill Road and the 245 and 182. Therefore there's no need to touch the 79 or am I missing something? I've heard it may be sent directly via the 245 thus omitting Wembley Central - even if one of the routings you mentioned was chosen, the 112 would still suffer as currently, both the 83 & 112 are very busy between Alperton & Ealing and the opportunity to deck the 112 has passed for now. With such a split to a long route I would be very surprised if there was no overlap between the 83 and 483 rather than an "enforced" walk round the corner at Alperton. Where LRT / TfL have split long routes there is usually an overlap to avoid massive numbers travelling to the end of a route and then having to crush on to the connecting route. I'd expect TfL to have worked out where the major demand flows are and tried to ensure the overlap caters for them as much as possible. For example I doubt there is a lot of demand east of Wembley Hill to beyond Alperton hence the possible overlap there. I haven't seen any numbers for the 483's frequency but I'd be surprised if it was much lower than the 83 currently provides. Clearly there is the possibility that some current journeys will be broken as a result of the change but I'd expect TfL to have worked to minimise the number. The unknown for them is how much the existence of a new through service to Harrow will trigger traffic generation thus eating up capacity for displaced route 83 users. What I think could happen is it goes via Chaplin Road which is the H17s routing to Ealing Road before performing the right turn into Ealing Road. There is still a lot of things to be discussed so everything is subject to change. I'll pop Robert Munster an email to advise him to take down the routing of the 483 as, as far as we know it's going to serve Harrow Bus Station and Ealing Broadway only. One thing that is known is tfl would rather have both routes overlap each other at some stage which is the general practise when routes are split and given the 'magic' 4. 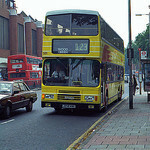 Look at Routes 187/487, 260/460, 207/427 so I imagine the 483 will serve Ealing Road. I think the whole East Lane idea is just stupid and so do some people I know. From what I have been told it will have a headway of every 5 minutes from the Harrow end and 4 1/2 from Ealing. When did that change? If that's the case, where's the link to Ealing Hospital if the 483 is cut back to Ealing Broadway? There would be NO 83 or 483 to the Hospital, and only the 427/207 stopping outside. At least there's N83 there...probably.